Thank you for helping the wildlife rehab centre by joining our email list! We will NOT share your email address with anyone. Once you’ve filled in the form below and clicked the button, you’ll receive an immediate automatic email from us asking you to click a link in the email to confirm your subscription. (Canadian Anti-Spam Legislation requires that we follow this two-step process.) You will not be subscribed to our list until you have clicked that link in the email. If you have any challenges with this form, just email us telling us you want to receive the newsletter by email and providing your first and last name. If you do not sign up to receive the newsletter by email, and are already in our Canada Post mailing list, we will continue to send it to you by Canada Post. Note: The reason we ask for your mailing address in the form below is so that when we remove you from our Canada Post list we’ll know we are removing the right person. Thank you! 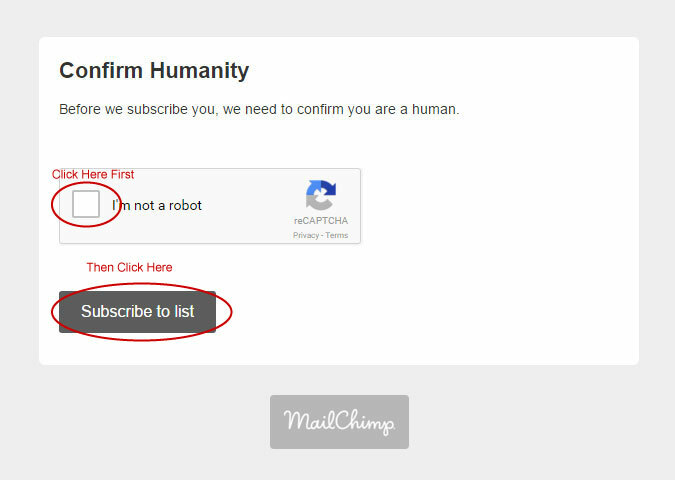 After you have clicked the link in the email we send you, MailChimp may ask you to “prove that you are human”. If you see a page like this, you’ll need to click twice, as shown in the image below.